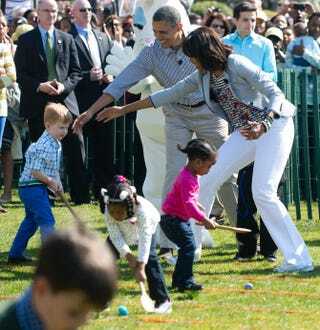 President Barack Obama and first lady Michelle Obama cheer on children taking part in an egg-rolling race as part of the White House Easter Egg Roll on the South Lawn of the White House April 1, 2013. People for the Ethical Treatment of Animals, more fondly known as PETA, is targeting first lady Michelle Obama in a new YouTube video, pleading with her to end the tradition of using real eggs in the annual White House Easter Egg Roll. “I'm writing on behalf of People for the Ethical Treatment of Animals (PETA) and our more than 3 million members and supporters to urge you, with all due respect, to use reusable plastic or ceramic eggs instead of hard-boiled chicken eggs at the White House Easter Egg Roll,” PETA President Ingrid Newkirk wrote in the letter.